Unit 2: Count to 100 Every Day! LESSON 2: Dice Rollin': Associative Property at its Most Fun! LESSON 5: Find a Match! SWBAT identify the "friendly" number sentence that helps them solve a 3 addend equation. Introduce students to the concept of "simplifying" as they find the friendly number sentences that help them solve 3 addend number sentences! Students in first grade apply mathematical properties to add and subtract. In this lesson, students focus on the associative property of addition, which says that students can group the addends in any order to get the same total sum. In this lesson, I call this finding a friendly number sentence. Students are using repeated reasoning (MP8) to look for a number sentence they already know the answer to so they can make adding 3 numbers easier. For example, when solving 9 + 1 + 4, they can make 10 and then add 4 more or make 5 and add it to 9. Hook: Today we will be looking at how to solve 3 addend number sentences again. We can make these easier by grouping addends together into friendly number sentences. Friendly number sentences are the ones that we know right away. Objective: What friendly number sentence can I use to help me solve this equation? Today we are going to take a 3 addend number sentence and make it easier by simplifying it. That means we used friendly numbers to make this number sentence more simple or easy. Present Problem: I have 4 crackers and 4 cookies. How many snacks do I have? Partner talk: Solve the problem! Feign a mistake, classic 1st grade teacher trick: Uh oh! I forgot a sentence of this story problem. Add in: Then I got 1 more cookie. How many snacks do I have now? I need to add 1 more. How did you know so quickly? That is called simplifying. When we simplify, we make things easier. We didn’t need to write all 3 numbers down for this problem because we already knew 4+4 was 8. I use the mathematical term, "simplifying", here because a key Common Core shift is using academic vocabulary! Problem 2: Ms. Cole has 5 strands of green beads and 5 strands of purple beads. Then she gets 4 strands of gold beads. How many strands does she have now? I’ll have students solve this problem on white boards or with cubes. Cubes are easiest to manipulate and move around, so students who are in need of intervention need to use cubes. Show this number sentence with your cubes. Where are the friendly numbers in this number sentence? What number sentence could I write to match the story? 5+5+3 =13. What number sentence could I write to show how we simplified it? 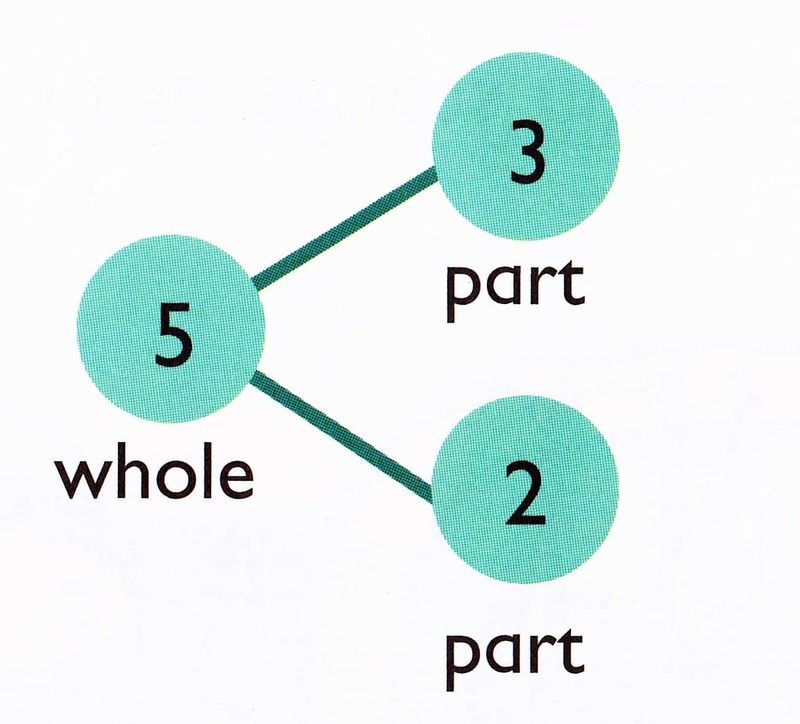 If your students have used number bonds to represent concepts before, then this activity will need less explaining. If this is the first time using this representation, students will need to practice more before heading off on their own. I’ll model showing what we did in the last problem using a number bond. A number bond is one way students can practice modeling with mathematics. They are very visual, and help students see how numbers come together to create one total. Big points for students to understand about the number bond: These lines show me that these numbers are being combined to create this sum at the top. We have 3 circles below the sum because we have 3 addends in our problem. Game Rules: I’ll go through each step of the game rules and model each step. Roll 3 dice. Write each number in one of the addend circles. How many in total? Write the sum at the top. Which two numbers did you combine first? Highlight the friendly numbers. After I model each step, I’ll have students practice with me on the rug using white boards. I'll roll the dice and have students draw on their white boards. White boards are a great engagement strategy and allow me as the teacher to quickly identify any misconceptions students have. We will then share out what students did and show our white boards to a partner. You can watch 2 students explain how they solved 2+2+3. You'll especially love the little girl at the beginning! She is so excited to show what we she knows! Directions: Students use the number bond recording sheet! You can find it here on this blog for free! Students color the two numbers they added together that made the number sentence "friendly". Intervention idea: Students create cube towers for each roll. Students can actually combine the cubes together. These students need the concrete visual. Extension idea: Students can use number cards instead of a dice if you want them to use larger numbers! Go to Doodle Bugs Teaching for a free adorable set of decade cupcake number cards. Or you can play it with a "grab it" spin. I used that method so kids were able to include ones in their number bonds. You can watch a video of us playing here! Come back together and share one student’s work. Partner talk: What friendly number sentence did they use to help them solve this problem?